The holiday season is a whimsical time of the year, and San Francisco doesn’t hold back on the festivities, lights, and overall spirit throughout. There are so many things to do and see in the city that will get anyone into the Christmas mood, so bundle up and head to San Francisco to explore all the wonderful Christmassy activities! Union Square turns into a Christmas wonderland during the holiday season. Everything from Macy’s to Saks Fifth Avenue and the rest of the surrounding shops are decked out to the max. The Christmas tree in the center is the biggest in the area and seems to drip Christmas spirit. At the beginning of the holiday season, a huge annual tree-lighting festival takes place to start the season off right. Get some shopping done at some of the world’s best stores, dine at one of the many lovely restaurants, or simply wander Union Square to feel the holiday magic! The San Francisco Ballet’s redition of The Nutcracker is simply divine. Sure, this Christmas classic is performed throughout the country, but there’s something special about watching it in the beautiful and historic War Memorial Opera House across from San Francisco City Hall. Bring the entire family to the majestic theater for an afternoon or evening of dance and storytelling. This holiday season, join us as the lights dim, the music soars, snowflakes swirl, flowers dance & a little girl dreams about a whole new world in a #Nutcracker that is as unique as it is magical. Onstage Dec 13-30, prices for some performances are already increasing based on demand. Buy today for best seats & prices! A holiday tradition since 1994, this special parade includes more than 60 boats completely decked out with lights and other holiday décor. The parade begins just off of Pier 39, and the boats continue past Fisherman’s Wharf, to Fort Mason and the St. Francis Yacht Club. The parade then rounds Crissy Field and returns to the waterfront. The beauty of the route is that there are a number of great locations with fantastic views of the parade. This year, it takes place on December 15, and it’s free! Sorry to report, but this gingerbread house will put anyone else’s to shame. The Fairmont Hotel took this traditional and yummy Christmas dessert and brought it to life. Created by two incredibly talented chefs, the Gingerbread House measures more than 25-feet high, 30-feet wide, and it’s two stories tall. More than 3,000 pounds of icing and more than 10,000 gingerbread bricks go into this life-sized Christmas treat. The Gingerbread House is presented in the hotel lobby right after Thanksgiving, and it’s an amazing and dazzling sight. Not to mention the classically sweet holiday aroma that fills the air! Explore all the holiday lights and decorations throughout the city while aboard a vintage Mack fire engine. Get into the holiday spirit as your knowledgeable and enthusiastic guide takes you through the Embarcadero, Fisherman’s Wharf, Market Street, and Union Square. This intimate tour fits about 12 people, and it is absolutely magical to see all the lights in the city while holiday music plays. They even offer fire jackets to keep warm during the evening, which makes for amazing photos! Macy’s in Union Square teams up with the SPCA every year for a lovely and inspiring holiday tradition; the department store displays rescued and adoptable cats and dogs with their famous holiday decorations in the storefront windows. Just try to walk by without giving one (or maybe two) of these animals a home. Once you’ve found a new furry friend, venture to nearby Stockton Street for the Winter Walk SF, filled with festive fun! This is an absolute must when it comes to Christmas traditions. Round up the kids and make sure to get a picture with Santa. Even if you don’t have kids, you’re sure to get a great holiday photo. There’s a handful of places where you can find Santa ready for photo ops in San Francisco during the holidays, including Pier 39, Westfield Shopping Center, The Ritz Carlton, and Macy’s in Union Square, just to name a few. Just because it doesn’t snow in San Francisco doesn’t mean you have to miss out on this wonderful Christmas classic. There’s a good number of places in the city with outdoor ice skating rinks, but one of the best for some Christmas skating is the Embarcadero Center. 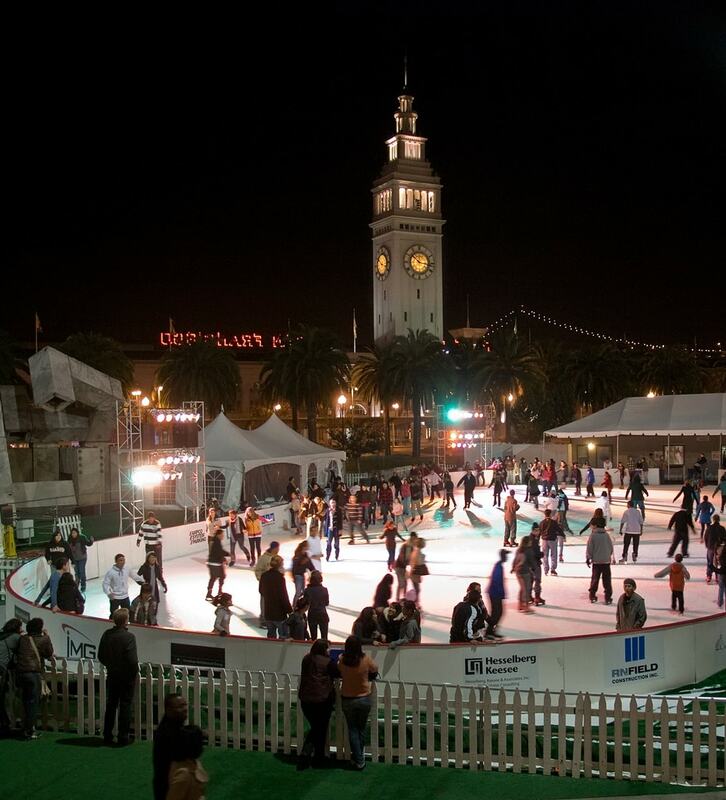 The rink is across from the Ferry Building, where there’s always some nice fun and shopping happening. The Bay Lights are lit up all along the water, and the views are gorgeously festive!